Corn is a New World food. Both Amerindians and enslaved people brought from West and Central Africa cultivated maize in the Caribbean. Today dozens of varieties of maize sustain indigenous and peasant populations across Latin America, although rice is more prevalent in most Caribbean cuisines. 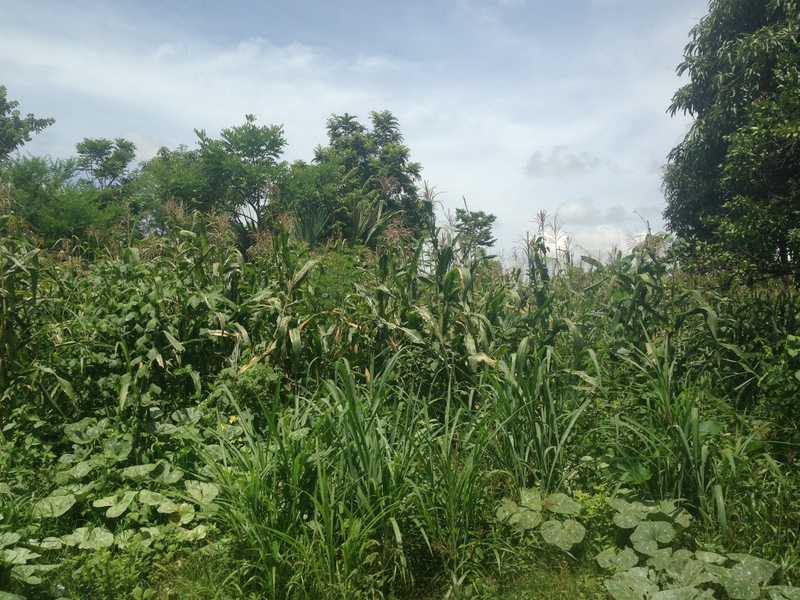 Rural Haiti, however, produces and consumes more maize than any other grain. Although Saint-Domingue’s indigenous population was made extinct by torture, forced labor, and mass extermination before 1600, enslaved Africans and their Creole (born in the New World) descendants continued to cultivate maize both as a subsistence and a cash crop. In the 1700s, French Saint-Domingue’s sugar economy was booming, and the slaves brought from Africa to work the fields outnumbered colonists nearly 10 to 1 by the end of the century. Seeking to maximize their profits, enslavers encouraged the people whose blood and sweat fattened colonists’ profits to grow their own food in small plots called provision grounds. Colonial mercantile networks brought saltfish and dried meat to the Antilles, but slaves grew staples like cassava, millet, plantains, and maize in their provision grounds, which they consumed or sold on the local market. Saint-Domingue was unique both in the extreme brutality of its sugar production regime, under which slaves’ rate of death rate far outstripped births, and in the the quantity of land devoted to slaves’ self-provisioning. In the last decade of plantation slavery in French Saint-Domingue, the colonists were importing 30,000 slaves a year, and as much as 30% of land in the Northern parts of the colony was cultivated as provision grounds. These historical conditions may have helped to ignite the Revolution in 1789, affording slaves the opportunity to sustain interpersonal and economic relations across territories that evaded colonists’ efforts at control. These conditions may also have shaped today’s Haitians’ preference for maize, as survival and self-reliance dictated the composition of the nascent free Black republic. Enslaved Africans from the Bight of Benin, who cultivated maize in their homeland, tended to survive the horrors of the plantation at a greater rate than those from rice and millet-growing regions. It is to this region that Haitians refer when they call upon “nan Ginen” – Africa, or the unknown world below the water. As rural Haitians do today, enslaved Africans in colonial Saint-Domingue probably ate whole roasted ears of maize, and ground the dried kernels into meal. 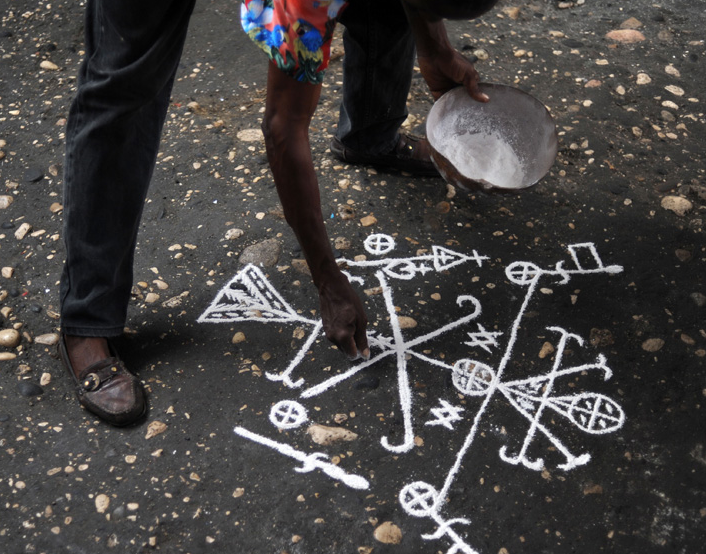 Practitioners of Haitian vodou have used cornmeal to trace vèvè like this one, below, to honor the spirits since the time of the Revolution. So how do we get from revolutionary maize to Miami rice? It’s a neoliberal rice story. By the 1980s, Haiti produced sufficient staple crops to meet the country’s food needs, and the majority rural population also produced for the export market. Today, in contrast, more than 60% of the food eaten in Haiti is imported, mostly from the United States. In the 1980s, the Center region produced maize in the greatest quantity, and it was sown on more hectares than any other crop country-wide; 8 times as much maize was consumed as rice (Doura 1995: 174). The damming of the Artibonite River in the 1960s allowed for large-scale farming in the fertile delta, and in the Artibonite region, an estimated 60,000 hectares of rice yielded an average of 123,000 tons, from 1980 to 1987. Today, rice is the most commonly consumed cereal across Haiti, and maize is second, although Haitian farmers are both producing less rice than ever before, and selling their crop for lower prices. Domestic rice production has been in steady decline since the 1990s, while maize production continues to follow an upward trend. Today you see these woven sacks everywhere, rolled open to show the mounded grains of white rice inside at the market, stretched on frames to make shallow baskets, and stitched together into large cylinders and piled at the side of the road, filled with charcoal waiting to be taken to market. These sacks hold “Miami rice,” so called not because it is grown in Florida, but because US cargo ships bring it from Miami to Haitian ports. Rice is one of the most heavily subsidized crops in the United States. In 1985, the IMF imposed its first structural adjustment policies on Haiti. As the country struggled to emerge from the Duvalier dictatorship, the IMF provided loans to which were attached policies of import substitution and tariff reduction. 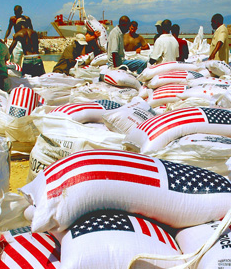 As Beverly Bell and Tory Field write, “by 1995 the Haitian government, under pressure primarily from the IMF and U.S. government, cut import tariffs on food basics to as low as 3%.” The market was flooded with heavily subsidized rice grown in Arkansas (yes, then-president Bill Clinton’s home state), with imports increasing more than 150% between 1992 and 2003. Rice imports surged again after the earthquake of 2010. 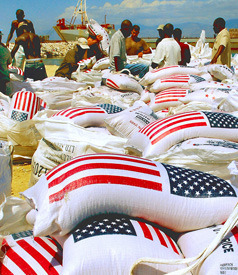 Bell and Field report that by the mid-1990s, a single corporation, American Rice, imported at least 50% of all rice eaten in Haiti, and has also been one of USAID and the USDA’s key beneficiaries in post-earthquake food aid contracts. The transformation of Haitians from “maize people” into “rice people” has been deliberate and violent. Thinking about maize in rural Haiti reveals a struggle for self-determination that stretches from the Middle Passage all the way to the neoliberal present. In 2010, members of the Peasant’s Movement of Papaye (MPP), where I am working this year, marched to the provincial capital in defense of their seed sovereignty. In the town square, they burned a pile of hybrid maize seeds Monsanto had donated to Haitian farmers through a post-earthquake “aid” contract. Although rice may spring to mind first when thinking about Haiti in the context of the radical Americas, it is maize that allows the reframing of peasants’ struggle as one of Latin American solidarity and historically rooted self-determination. Berlin, I. (1993). Cultivation and culture: Labor and the shaping of slave life in the Americas. Charlottesville: University of Virginia Press. Haggerty, Richard A., ed. (1989). Haiti: A Country Study. Washington: GPO for the Library of Congress. Kenneth F. Kiple. (2000). The Cambridge world history of food (Vol. 2). Cambridge: Cambridge University Press. Mullaney, Emma Gaalaas. (2014). “Geopolitical Maize: Peasant Seeds, Everyday Practices, and Food Security in Mexico.” Geopolitics 19:2, 406-430.